Earlier this week I sprinkled the very last of my chili powder into my homemade ketchup and immediately thought I should try making my own homemade chili powder. I was a little nervous. It seemed like it might be really hard but I did some reading and figured I should give it a try. Last summer our neighbor gave us a ton of peppers. I froze some, and dried a bunch. Usually I toss a pepper or two into the pot when I’m making broth or beans, but it’s going to take me AGES to use them all up. Even if I messed it up and had to throw them out, I certainly wouldn’t be feeling a lack of dried chilies! I was super surprised to find out it’s actually really easy. Essentially all you have to do is grind the chilies into a powder. Genius! Chili. Powder. You could do it with a coffee grinder, a mortar and pestal, and probably a food processor, but I decided to use my blender. I use my blender for everything. (That’s probably why I’ve had to replace it a few times…) Luckily now I have a Ninja food processor, which blends extremely well, even if the blender canister is poorly designed for cleaning. Dried Chilies (Here’s a quick overview on how to dry foods without electricity). Ta da! Homemade chili powder! 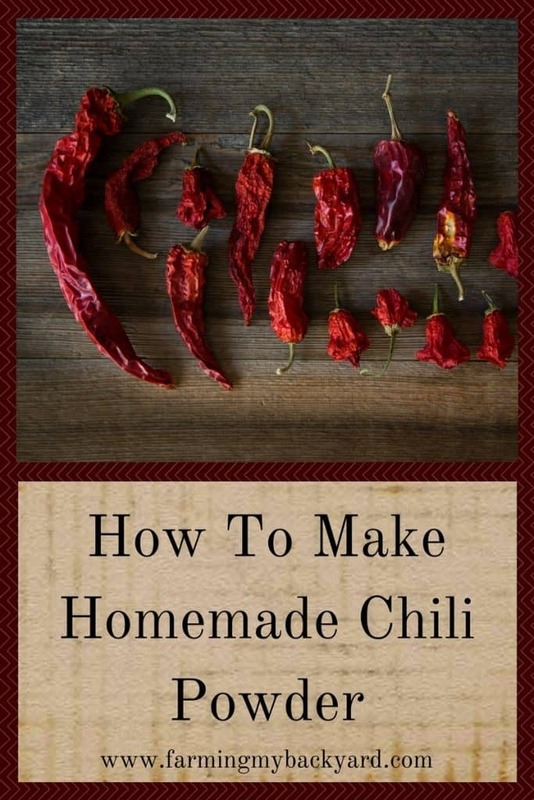 So…the first batch of chili powder turned out so awesome that my husband decided to make a batch using the habanero peppers he grew in his garden. The two containers of powder were unlabeled. (Always label people!). For dinner one night I made my own enchilada sauce and tossed in multiple tablespoons of what I thought was chili powder. I’m in the kitchen cooking, and my eyes are watering, and the kids start hacking and coughing. You’d think I’d have figured things out by now. But NO. My poor husband gets home from work and I ask him to taste test the sauce. I think the poor guy had blisters in his mouth for a week. Needless to say, don’t mix up your habanero powder with your milder chili powders!